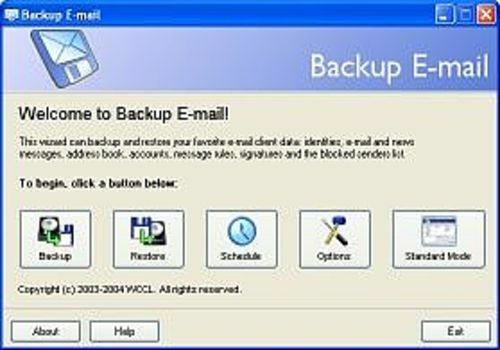 Backup E-mail uses an easy wizard interface to backup everything from Microsoft Outlook, Outlook Express, Eudora Pro & Light, Netscape Messenger, Netscape Mail, Opera, IncrediMail, Pegasus Mail, TheBat, and PocoMail. Just click and you're done! Backup E-mail takes your e-mail messages, address book, settings, mail and news accounts, message rules, blocked senders lists and signatures - and stores them all in one single file, ready to store on disk or CD. Backup E-mail includes a scheduler, enabling you to backup exactly what you want at the times you specify. It simply runs quietly in the background and uses your custom settings to archive your e-mail messages and keep your data safe and secure. Transferring your e-mail settings to another computer? Simply backup your e-mail on your first computer, then restore your settings onto the second computer. It'll be just as though nothing has changed. Your e-mail settings will remain intact!